Hoodie Allen is all about his fans and this year he’s really taking his love for them to the next level. Hoodie just announced a special two night event called “Fansgiving” where the fans pick the entire set list and every one gets a meet&greet with Hoodie! Now that is how it’s done! Hoodie took to Twitter to make the special announcement and to let his fans know how much he appreciates them. Every single person who buys a ticket will have the opportunity to make their dream Hoodie Allen set list which is something that we’ve always wanted to do! Tickets to Hoodie Allen’s “Fans-Giving” 2016 shows go on sale Friday, October 21st at 10am EST. Check out the video from Hoodie below and don’t miss these shows! Grab a copy of Hoodie Allen’s “Happy Camper” on iTunes or Amazon so you can sing along with Hoodie this Fans-Giving! Be sure to follow Hoodie Allen and Secret Fangirls on Twitter. Connecticut’s own Alec Chambers recently released his debut single “Whole Again” and announced an EP coming in early 2015. The EP was produced by Robbie Gauriglia (Oh Honey) and features songs co-written by Lee Groves (Black Eyed Peas.) At 19, Alec is being hailed as a “teen virtuoso,” having understood chord charts well before he could drive. He taught himself how to play guitar by learning to play his favorite songs by ear. Each song on the EP was co-written by Alec, who has written dozens of songs, many with platinum selling songwriter-producer Sara Nagourney. Alec is a talented multi-instrumentalist with a guitar driven pop sound. His debut single is one of those tracks you just want to put on repeat, and we can’t wait to hear more! Listen to his single “Whole Again” below and be sure to pickup a copy on iTunes now! Alec Chambers will be playing a few shows around the New York City area in the new year! Check out the dates below. Follow Alec Chambers and Secret Fangirls for more updates! 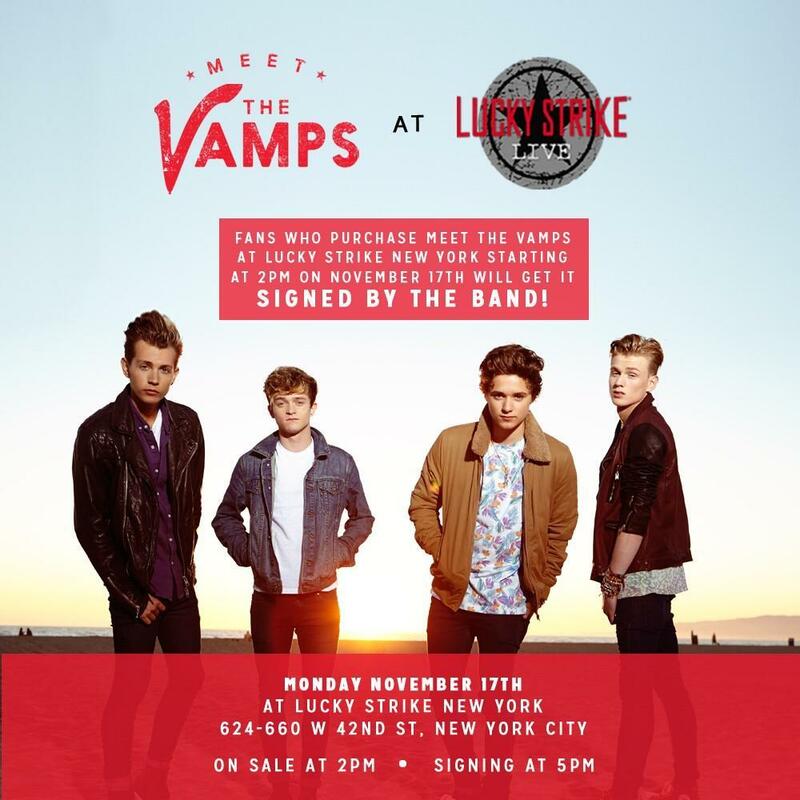 Meet The Vamps at Lucky Strike In New York 11/17! The Vamps have been busy celebrating the US release of their debut album “Meet The Vamps,” and we’re so excited that they will be making their long awaited return to NYC next week! You can buy a copy of “Meet The Vamps” at Lucky Strike in Times Square…and then get to actually Meet The Vamps! That’s right – Brad, James, Tristan and Connor will be signing copies of their album for fans who purchase the album at Lucky Strike beginning at 2pm on Monday, November 17th. The album signing/meet and greet with the band will begin at 5pm, for fans who purchase the album at Lucky Strike that day. Not in New York? You can see The Vamps perform as part of the Radio Disney Birthday Bash on November 22nd in LA. They’ll be headed down under to tour Australia in January with AJR!